One of the International Astronomical Union’s (IAU) requirements for a celestial body to be classified as a planet (or a dwarf planet) is that it orbits the Sun. All of the planets have different orbits, which affect many of the planets’ other characteristics. Since Pluto became a dwarf planet, Mercury is the planet with the most eccentric orbit. The eccentricity of an orbit is the measurement of how different the orbit is from a circular shape. If an orbit is a perfect circle, its eccentricity is zero. As the orbit becomes more elliptical, the eccentricity increases. Mercury’s orbit ranges from 46 million kilometers from the Sun to 70 million kilometers from the Sun. Venus, which is right next to Mercury, has the least eccentric orbit of any of the planet in the Solar System. Its orbit ranges between 107 million km and 109 million km from the Sun and has an eccentricity of .007 giving it a nearly perfect circle for its orbit. Earth also has a relatively circular orbit with an eccentricity of .017. Earth has a perihelion of 147 million kilometers; the perihelion is the closest point to the Sun in an object’s orbit. Our planet has an aphelion of 152 million kilometers. An aphelion is the furthest point from the Sun in an object’s orbit. Mars has one of the most eccentric orbits in our Solar System at .093. Its perihelion is 207 million kilometers, and it has an aphelion of 249 million kilometers. Jupiter has a perihelion of 741 million kilometers and an aphelion of 778 million kilometers. Its eccentricity is .048. Jupiter takes 11.86 years to orbit the Sun. Although this seems a long time compared to the time our own planet takes to orbit, it is only a fraction of the time of some of the other planets’ orbits. Saturn is 1.35 billion kilometers at its perihelion and 1.51 billion kilometers from the Sun at its furthest point. It has an eccentricity of .056. Since it was first discovered in 1610, Saturn has only orbited the Sun 13 times because it takes 29.7 years to orbit once. Uranus is 2.75 billion miles from the Sun at its closest point and 3 billion miles from the Sun at its aphelion. It has an eccentricity of .047 and takes 84.3 years to orbit the Sun. Uranus has such an extreme axial tilt (97.8°) that rotates on its side. This causes radical changes in seasons. Neptune is the furthest planet from the Sun with a perihelion of 4.45 billion kilometers and an aphelion of 4.55 billion kilometers. It has an eccentricity of .009, which is almost as low as Venus’ eccentricity. It takes Neptune 164.8 years to orbit the Sun. 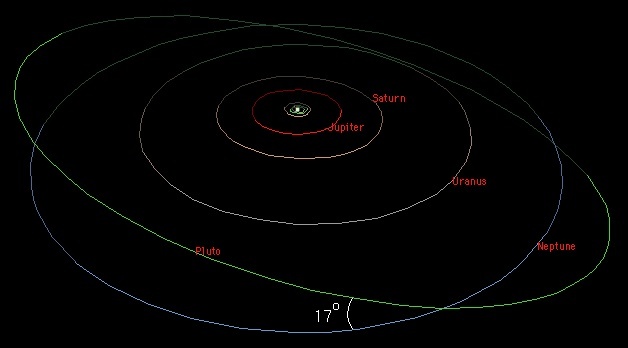 Universe Today has articles on orbits of the planets and asteroid orbits. For more information, check out articles on an overview of the Solar System and new planet orbits backwards. Astronomy Cast has episodes on all the planets including Mercury.